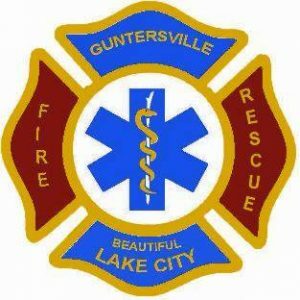 Guntersville Fire & Rescue is a full-service fire, medical and emergency service agency that provides basic and advanced life support, fire prevention, fire suppression, technical rescue, and hazardous material response. In addition, the department conducts arson investigations, building plan reviews, enforces state and local fire and life safety codes, and administers public fire education programs. Guntersville Fire & Rescue is composed of 36 firefighters with a fleet consisting of 4 Advanced Life Support (ALS) engine companies, 1 ladder company, and 1 heavy rescue unit, 2 marine vessels, 1 wildland brush truck, all strategically located in Guntersville neighborhoods. The Department is equipped to respond to all fire, medical, natural disaster, hazardous materials, water, and terroristic events that occur within Guntersville and its surrounding communities. Each year, Guntersville firefighters and emergency medical technicians faithfully respond to over 2,200 emergency calls for service. Under the general guidance of Chief Waldrop, the department is managed on a 24/7/365 basis by three Chief Officers. The department serves the community around the clock with operations personnel on duty and at your service every second of every day. Guntersville Fire & Rescue reminds you in any Emergency remember to dial 911. ~WARNING~ Although this is just a simulation and no students are actually injured in this demonstration, the images in this post can be difficult and disturbing to some. Prom week is upon us here in Guntersville and this morning, multiple agencies from our area participated in what is called the "Prom Promise". This scenario gives students a real-to-life look at our response to a motor vehicle collision (MVC) when alcohol is involved. During the scenario, the students witnessed an accident scene where fire department personnel had to remove doors and tops of vehicles to extricate patients allowing for medical care. The MVC scenario had multiple injuries, including one fatality. As first responders, we experience these scenes all too often, and our hope is that the real-to-life scenario seen today will make students more aware of thier choices, not only for this special week, but for the rest of their lives. Good for you! When I was young, my father worked for a towing and salvage business and he would bring me to see the cars that had been involved in drunk driving accidents. Nothing else leaves quite the Same impression. Thank you for your service and message to help our children. Thank you GHS, Guntersville Fire/Rescue, Guntersville Police, and all the people in the community that care about our children. You took the time to show what can happen when people drink and drive. Thank you. Thats awesome! Surely the kids got the picture with this. Thanks for your service! Thank you for providing this important message to our youth!! Kudos to those who staged this eye opening event for our kids—wish I’d been there to see—they said it was very powerful and it looked that way from what we saw on news. Such a big effort and so many involved—amazing! I hope the kids got the message. Any form of distracted driving kids, phone, drinking, drugs, tired, arguing, crying, eating ... the blink of an eye can change your life. Guntersville Fire/Rescue shared a link. Tonight we spring forward 1 hour. That means today is a perfect time to check or install your smoke alarms.